The Hague has a plethora of museums. You will need several days to visit them all. If your time is limited, be sure to visit Panorama Mesdag. This circular painting gives the impression that you are inside the painting. Panorama paintings were popular in the nineteenth century, but many were lost. The Raclawice Panorama in Wroclaw, Poland is one of the panoramas that survived, it is a monumental painting measuring 15 × 120 metre, showing the Battle of Raclawice. 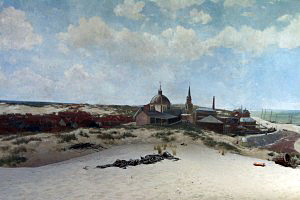 Panorama Mesdag is unique because it is the only panorama painting in Europe depicting an everyday scene instead of a battlefield. I’m leaning against the railing of the beach pavilion on top of Seinpost sand dune. A panoramic view pans out in all directions. The sun breaks through the clouds and creates shifting patterns on the beach and the sea. Bathers in funny, old-fashioned swimming costumes, frolic on the sand. Sea gulls sit on beached fishing-boats. The cavalry is exercising and a woman sits in front of a painter’s easel in the shade of a sun umbrella. Another women mends fishing-nets. An abandoned clog and an empty bottle are half covered in the white sand. Behind me is Scheveningen village with its steepled church and lighthouse. People walk in the main street on their way home. Panoramas were popular attractions in pre-cinema and pre-television days. For a moment I believe that this is the real view, but what I see is a 120-metre circular canvas. Hendrik Mesdag created this illusion of reality in 1881. Helped by his wife Sientje and four other painter of the Hague School, it took him four months to complete this work of art. One of his co-painters was Breitner who was to became a famous people painter. 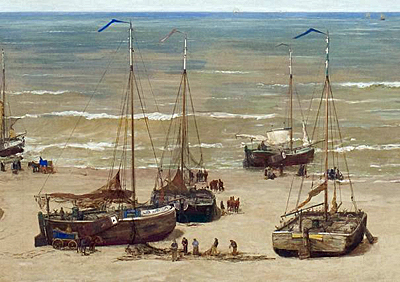 Mesdag himself, a marine painter, took care of painting all the boats and the sea. It was common practice in panoramas that the painter depicted himself in his painting. Instead of depicting himself, Mesdag added his wife Sientje. She is the lady behind the painter’s easel. Panoramas are called paintings without borders. When you look at a panorama painting, you do not see the real world. This is done on purpose so that you cannot compare the scenery you see with reality. Looking at a 'flat' painting, your eyes see what is around this painting; the real world. In a panorama painting you cannot see the real world. Therefore the illusion of what you see becomes the real world. This is why panoramas are so real. The entrance to Panorama Mesdag is through a dark corridor at the far end you climb up a winding staircase. This takes you to the viewing platform. You imagine yourself in a beach pavilion with views into all directions. It takes some time to adjust your eyes to the bright light which heightens your feeling of disorientation. The building has a glass roof, which cannot be seen when you are in the pavilion. This a perfect touch because the real sun throws real shadows across the beach, the sea, the dunes and the houses. The effect is spectacular. 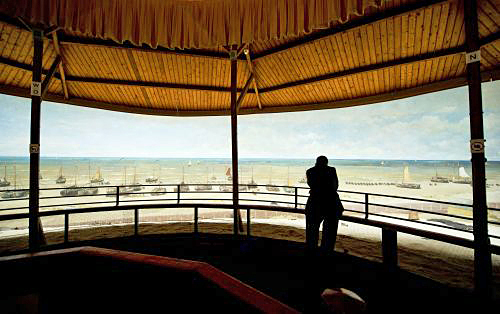 The real sand that surrounds the pavilion merges with the painted sand, thus obscuring the lower frame of the painting. The upper frame of the painting is also hidden from view by the roof of the pavilion. Walk round the railing and take in the vista, first the wide expanse of the sea, then the contours of Scheveningen village. 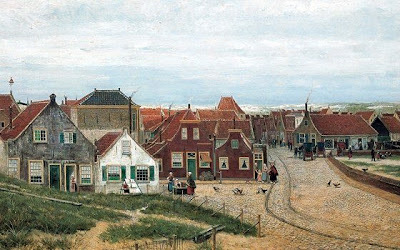 Now go to the real Scheveningen to see that more than one hundred years later, the view has not changed very much.